Published: Sep 20, 2018 · Modified: Apr 11, 2019 · By Jen Sobjack · This post may contain affiliate links. 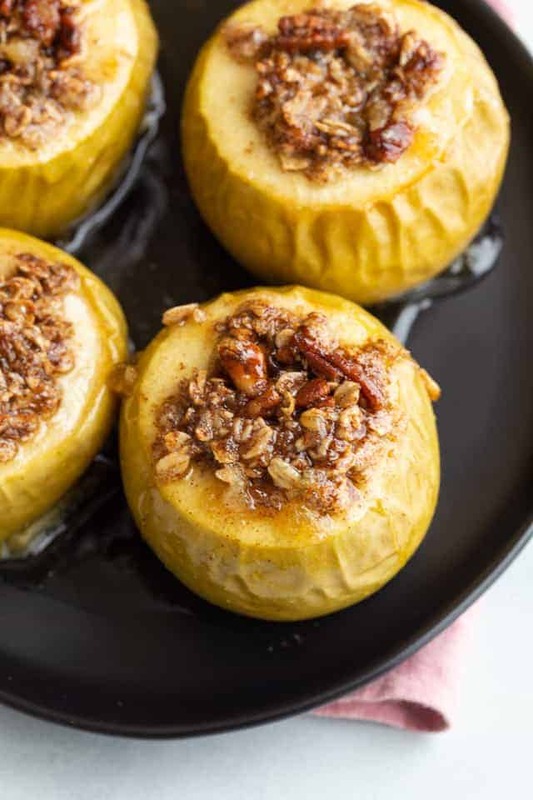 Fall isn’t complete without Baked Apples! 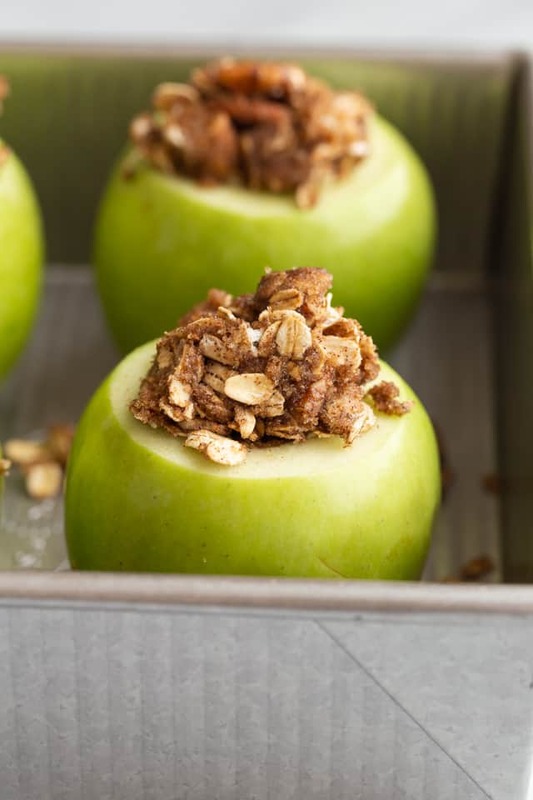 Each apple is filled with a mixture of oats, pecans, brown sugar, and fall spices. A maple cider mixture is drizzled over the top for added flavor. I’ll pretty much eat apples any way I can get them. Apple cobbler, apple slab pie, apple fritters, and apple scones are a few examples of some of my favorite ways to enjoy apples. But today’s baked apples are my latest obsession. They are so good you guys! Perfectly baked, stuffed with a deliciously sweet filling, and drizzled with maple cider. What more could you ask for in an apple dessert? 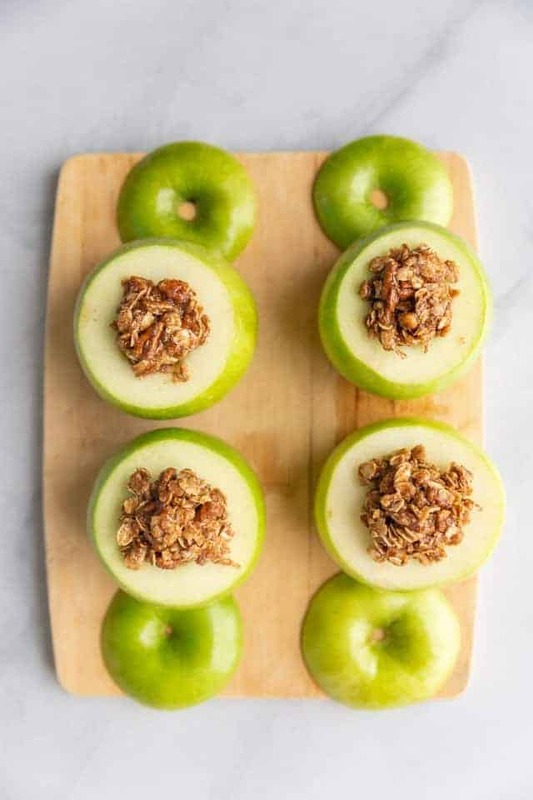 This recipe is super easy to put together and the apples taste best when served warm so you can enjoy them right away. They’re also super tasty with a scoop of vanilla ice cream or dollop of whipped cream. I find that Honey Crisp or Granny Smith apples work best for baked apples. They both have a balanced sweet and tart profile. And they hold up well once cooked. How to make baked apples? First, you need to slice a very thin piece off the bottom of the apple. I’m talking about the blossom end. Just trim off a sliver so the apple sits flat. Then slice a small sliver off the top of the apple, the end with the stem, and use a melon baller to scoop out the core. Be careful not to cut all the way through the bottom. You don’t necessarily have to trim a sliver off the top but I think they look nicer once baked. Combine pecans, oats, brown sugar, cinnamon, allspice, salt, and softened butter. Use a fork to work the mixture together until the butter is evenly coated over the oats and pecans. Spoon the filling into the cavity of the apples. Really press it in and then mound it up over the top. Pour a mixture of equal parts maple syrup and apple cider in the bottom of an 8×8-inch pan and set the apples inside. Bake them for about 30 minutes. I like to baste the apples every 10 minutes or so with the liquid from the bottom of the pan. 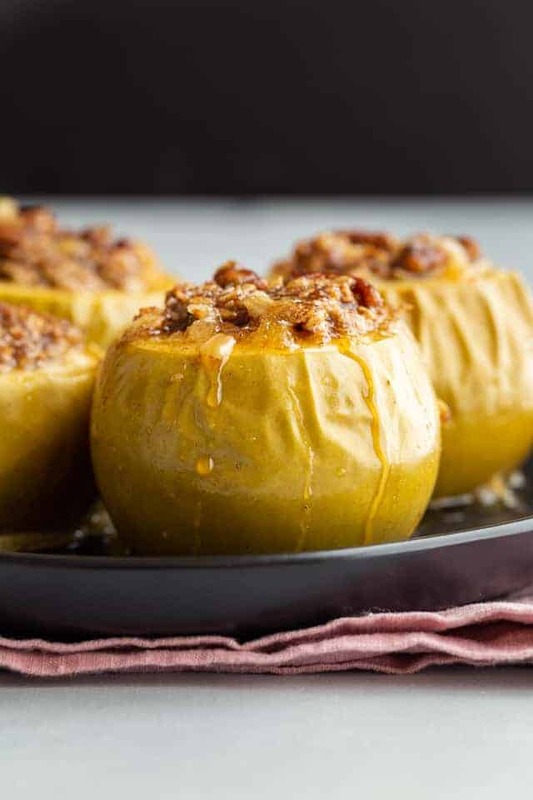 The baked apples should be firm but tender enough to insert a skewer with little resistance. Transfer the apples to a serving platter and drizzle them with the remaining liquid from the pan. Adjust the oven rack to the middle position and Preheat to 375°F. Shave a thin slice off the bottom (blossom end) of the apples so they sit flat. 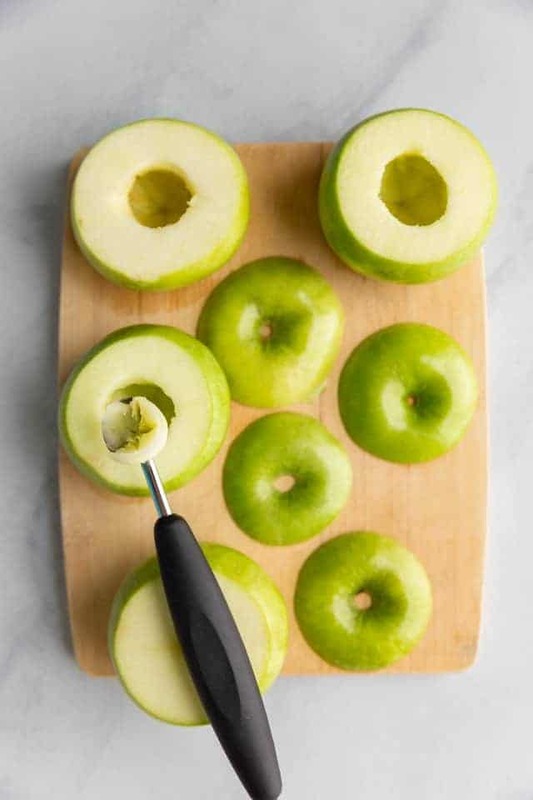 Shave another thin slice off the top (stem end) and use a melon baller or small measuring spoon to remove 1 and 1/2-inch diameter core, being careful not to cut through the bottom of the apple. 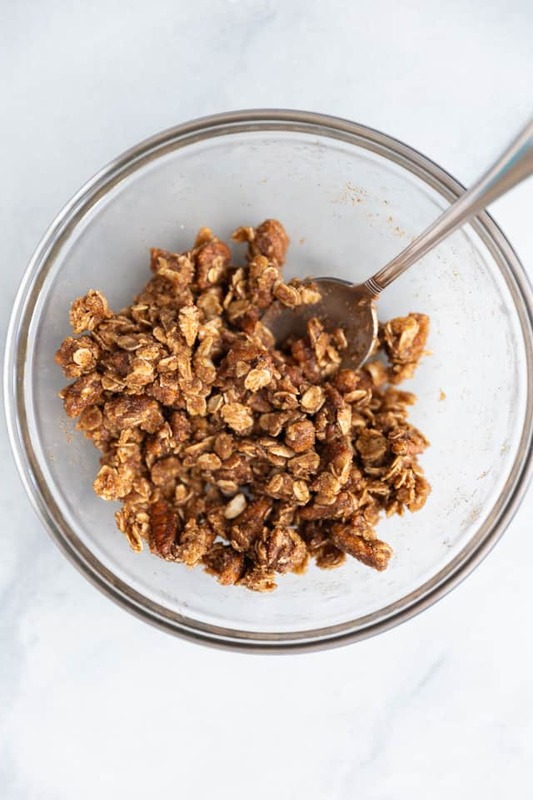 In a small bowl, combine the oats, pecans, sugar, cinnamon, allspice, salt, and butter. Spoon the filling inside the cavity, mounding excess filling over the top. Place the apples in an 8-inch baking pan. Add the maple syrup and cider to the bottom of the pan. Bake for 30 minutes, until a skewer inserted into the apples meets little resistance, basting every 10 minutes with the cider mixture in the bottom of the pan. Transfer to a serving platter. Pour remaining cider mixture over the apples and serve. Adapted from America’s Test Kitchen’s subscription site. 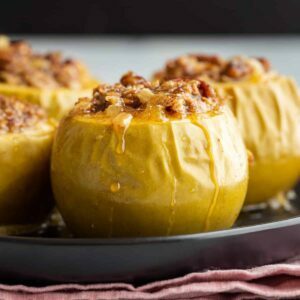 Thank you for a beautiful baked apples recipe. Made this tonight for my family and the kitchen smells divine. It tastes even better. 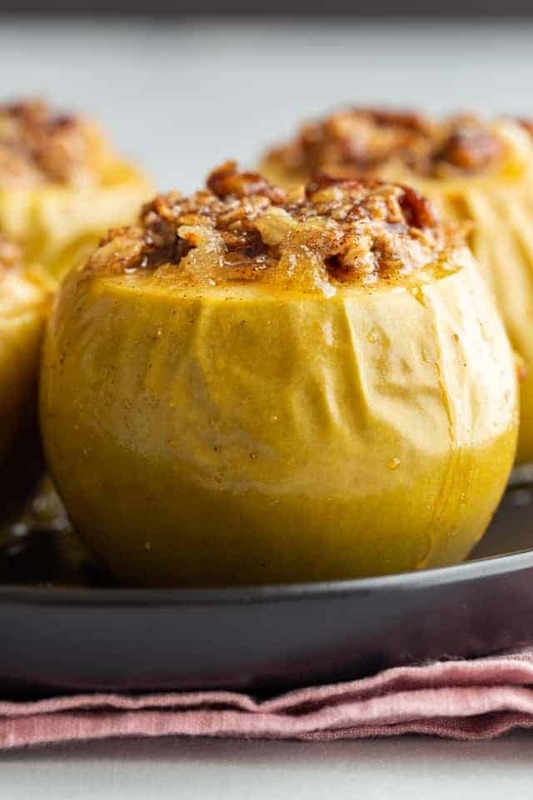 Baked apples are a fall favorite around my house. I can’t wait to make these!